As a building owner, there are so many things that demand your attention on a day-to-day basis. Between juggling the needs of tenants, keeping up with all the fixed costs, and making sure your company stays afloat, one thing that can get overlooked is building maintenance. 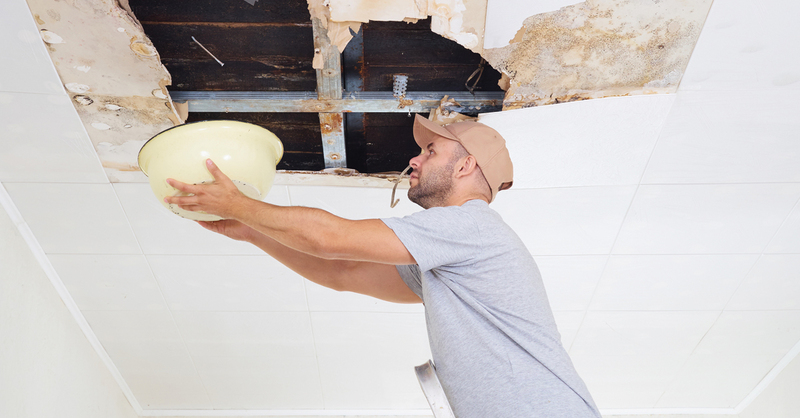 Interior Damage – Your roof protects everything underneath, from desks and office furniture to computers, operating machinery, painted walls, and lighting fixtures. The longer a leak is neglected, the more at risk your valuables are of being damaged. Exterior Damage – The outside of your home may not show obvious visible signs of roof leaks, but once you remove the shingles and inspect the decking underneath you’ll likely find harmful structural damage. Repairing the roof’s infrastructure is expensive, and the chances of a total roof replacement are likely if the decking is in very bad shape. Clients’ Perception – The perceived value of your business is negatively impacted when customers and clients notice dark stains from water damage on your company ceilings. Company Downtime – If a leak gets bad enough, you may have to halt operations entirely due to repairmen occupying space or simple safety concerns. Utility Bills – Water that seeps through the roof can damage the insulation that’s right underneath. Without proper insulation, inside air will release outdoors and your heating and cooling systems will work harder to keep a constant temperature. Long-Term Effects – As a leak spreads across your roof, costly damage is accumulating at every point it reaches. Between parts and labor, every square foot can be another “0” added to your bill. Ultimately, a roof leak that is left untreated will lead to a roof replacement, which is the most expensive treatment of them all. At Hi-Rise Commercial Roofing, we are Southern Florida’s experts in repairing water leaks before they cause dangerous implications. If you notice water damage on your ceilings or are dealing with water dripping into a bucket, reach out to our professionals for a free roof inspection today!